I remember buying a warm Russian beer in Moscow in the summer of 1998, sold in a scratched recycled bottle which cost six rubles. I also had to find an empty bottle to turn in to qualify to buy it. A bottle of real Dutch imported Heineken cost eight rubles. No wonder that, even in the regions, most beer was imported. Within weeks after the Russian debt default in the fall, the Heineken was 38 rubles but the Russian beer just eight. These days, Russia’s Heineken is brewed in-country, though most likely with some of the better malts now being made from Russian barley, and though the local brew doesn’t compare with the real Dutch version, it benefits from the fact that its brand is better known than some local ones. There has been nothing like Russian financial crises for observation of economic behavior of consumer businesses. The 1998 economic crisis spurred investment in domestic food production, and the current crisis should have the same effect if the Russian Central Bank doesn’t step too hard on the ruble to maintain a low exchange rate. In the summer of 1998, Russia was almost completely import dependent and farmers and food companies had difficulties competing. They were saddled with very low quality processing tools and poor or non-existent packaging. In retrospect, the transformation of the food industry has been marvelous, but there is still a lot more work to do. 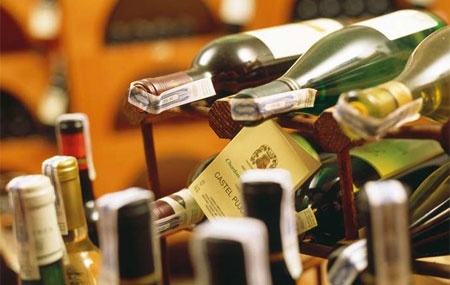 Bargain wines were the immediate effect of the current crisis for dollar or euro wine shoppers since the ruble shelf prices changed little if at all. A bottle of Barton & Guestier Sauvignon Blanc from my local convenience shop stood at 360 rubles for months, just over $15 before the crisis started, but $10 afterwards. No more – inventories that were bought last fall for the holiday season have cleared and the current price for the new B&G Sauvignon Blanc is 490 rubles, matching the previous dollar price. Shoppers for wines that are priced $20 or more will probably not notice or care that they are priced forty percent higher in ruble terms. But for the ruble shopper whose income was not indexed in dollars, the market has changed. I was surprised recently at the decline of the wine selection at my nearby Sedmoi Kontinent. Gone are many reasonable quality wines that must now be priced forty percent more in rubles, so they do not find a place on the shelves. This is not good news for our readers. 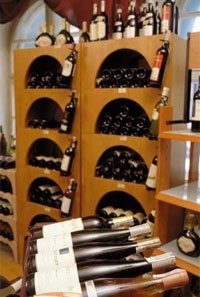 It has always been irksome to pay two or three times European or US prices for wines, and that will certainly continue. And unfortunately, the financial crisis will likely firm the hold that importers have on the market. But let’s forget those ruble prices and hit that “reset button” – Hillary Clinton had it right, we’re in for some “peregruzka”. We have been taking a new look at the wines in our “every day” price range, which is now 450+ rubles and other ways to economize. At the end of this article we have a list of some very good wines that we have found in this range, some new on the market. It’s also time to take another look at domestic wines, but we’ll leave that for another issue. Azbuka Vkusa still has one of the best wine selections among Moscow supermarkets, though the selection is also thinner than before. They also have better in-shop storage conditions than other supermarkets. Get a Metro card if you can. Metro has a decent wine selection and prices beat others by 20% or so. There are a few, but very few, very good wines at the boutiques (Magnum, Kaufman, Kollektsiya Vin, Grand Cru) at less than $20. For the wines they carry, buy at the boutique shops. Prices are likely to be the lowest since they are owned by importer companies. By comparison, Globus Gourmet prices are much higher for the same wines. Warning: I still see wines on sale that have been here since 2007. How to tell – they have the old customs tax stamp wrapped over the top of the capsule. I would be very cautious about any such wine given the difficult situation that wines face in storage in Moscow. The following are some “finds” from the past few months. Any wine that we score 4 or higher is well worth seeking out and we would not hesitate to recommend it or buy it again at the current price. These wines are likely to retail currently above 500 rubles but less than 750 rubles.